The viewer’s first encounter with suffragettes in Sarah Gavron’s Suffragette is a startling, witty and stylish one. The film’s protagonist Maud Watts (Carey Mulligan) has been sent on an errand all the way to central London from Bethnal Green, where she works at the Glasshouse Laundry. Pausing to admire a window display showing a behatted, gloved dummy watching over two smaller dummies in the height of Edwardian children’s fashion, her reverie is literally shattered by a stone thrown at the window by a prim-looking woman got up as a nanny, complete with Silver Cross pram (for carrying the stones, of course). This ain’t your Mary Poppins suffragism, the film seems to say. Echoing recent student and anti-capitalist protests in London and globally, it gleefully smashes not only property, but idealised middle-class family values. Up the women! Maud is knocked over, her hair and ideas set askew by the force of this confrontation – and by the wink she gets from a fellow laundry worker Violet Miller (Anne-Marie Duff), whom she finds herself defending the following day against their bully of a boss, Mr. Taylor (Geoff Bell). From such complicity, fired up by Violet’s daring (brilliantly rendered in Duff’s joyful, intense performance), Maud enters the world of the East London suffragettes at a crucial moment when both legislative change and militant action are in the air. Maud – a fictional character – is henceforth present at every major speech and action just as her life story carefully highlights multiple aspects of women’s oppression: the two come together as she delivers testimony to a parliamentary committee on women’s right to suffrage, describing her life as a laundry worker since childhood to the Prime Minister himself. Maud is a reluctant suffragist: married to Sonny (Ben Whishaw), mother of George (Adam Michael Dodd), she is a head-down hard worker despite Mr. Taylor’s long-term sexually abusive behaviour, and she is antipathetic to campaigning by Mrs. Aston (Romola Garai), an MP’s wife. Maud doesn’t reach the stand in Parliament through any desire of her own, but because Violet has been beaten by her husband and Mrs. Aston thinks Violet is too bruised to take the stand. From the start, this puts the viewer in a curious position: if we are to identify with the central character, what does it say about the filmmakers’ view of activism that Maud is passive and apolitical, and yet becomes so immersed in events at the highest level, launched from laundress to be part of Emmeline Pankhurst’s (Meryl Streep) closest circle, as in a traditional fairytale? Maud’s involvement with suffragism happens by contrivance, coincidence and coercion. As an innocent co-opted, she never uses nor hears words such as “socialism” or “anarchism”, never attends a worker’s education seminar, never connects with non-white communities of women who were organising in Bethnal Green where she lives: a considerable dumbing down and narrowing of the movement. We do see her working at the Union of Women’s Suffrage Association in a romanticised montage that also includes a soft-focus self-defence class. Maud is a problematic model for the question of how to grow grassroots movements by engaging hard-to-reach communities, particularly given that her story was partially based on the biography of Hannah Mitchell, a seamstress who became actively involved in the suffragette movement of her own volition, inspired by the suffragettes’ local organising. Part of the film’s problem is that in grafting a conventional hero narrative – full of epiphanies, setbacks and personal growth – onto a collective story, it is never quite sure which of the two is its focus. This is amplified through the consistent use of eccentric close-up framing and shallow focus, which is supposed to convey modernity and immediacy but instead creates a narrow frame in which Mulligan’s pout is often the sole medium for the feminist message. It is also implied throughout that Maud’s actions are in fact reactions: not so much to the facts of women’s oppression as to the behaviour and opinion of men. Her early involvement in marches is as much about her relationship with Sonny as with the cause; later, it’s about her antagonistic relationship with Inspector Steed (Brendan Gleeson). In her longest speech in the film – a voiceover reading of a letter turning down his insistence that she become an informer – Maud agrees with his assessment that they are parallel characters, both foot soldiers, struggling in direct relation to one another. Even at her most impassioned, Maud is passive. When she discovers that Sonny is giving up George for adoption by a middle class couple, she gives the inverse of Hawkeye’s famous speech to Cora from The Last of the Mohicans (Michael Mann’s 1992 film adaptation) – but rather than telling George: “I will find you,” as Hawkeye tells Cora, she tells him, less thrillingly: “I’ll be waiting for you to find me.” A desire to provoke male emotions seems to be Maud’s strongest motivation: when the film’s final crisis occurs, as Emily Wilding Davison (Natalie Press) is struck by the King’s horse, the editing of reaction shots implies that her death is bad because it upsets, in order of importance: the King (Simon Gifford), the Inspector, Maud. When the film allows its female characters to interact with each other, it is absorbing – not least in the energy of talented female performers such as Duff and Helena Bonham Carter (as Edith Ellyn) revelling in the opportunity to play scenes in conversation, debate and action with other women. That’s uncommon, if hardly unprecedented, in mainstream cinema, but not exactly distinctive in heritage drama, which often takes place in all-female worlds. Scenes in the laundry, the union and the prison suggest, but don’t specify, the horizontal network formed by the suffragettes (and historically by women before suffrage). However, when those interactions become too close – as when Violet finds Maud a room after Sonny kicks her out – any suggestion of lesbian desire has to be quashed through comedy. Likewise, the film’s initial commitment to militancy is confused as much by its content as its traditional narrative form. When Violet, by far the film’s most sympathetic and convincing character, pulls back from Edith Ellyn’s commitment to bombing the communications network, it feels like the film pulls back with her. Ellyn is depicted increasingly as a fundamentalist; her secret bomb-making workshop in the back of her pharmacy inevitably resonates with contemporary moral panics about terrorism, so we are asked to cheer when her husband Hugh (Finbar Lynch) first mansplains activism to her, then locks her in a cupboard so she can’t go to the Derby. Not quite the room of one’s own that Virginia Woolf intended. The Derby sequence – and the bombing of the Prime Minister’s summer house, where the shot of the car leaving the scene of the crime is twice as long as the sequence from setting the bomb through the explosion – is all set-up and no dynamism. Rather than a planned action derailed by the high-handed dismissiveness of patriarchal culture, Davison’s attempt is made to look shoddy and ill-planned. Making it Maud’s suggestion that they do “something” to capture the attention of the King, and making Davison little more than a cameo caricature by giving Press such a small role in the film, underlines the extent to which inserting a fictional protagonist into the epicentre of the narrative has skewed the larger political story, as well as obscured the individual narratives of the historical suffragettes. A film focused on Davison could make her less of a picturesque martyr and more of a complex figure, centring debates about tactics, politics and commitments. It would have to introduce the history of the women’s movement and its impassioned advocates sooner than the last ten minutes, in which – after Davison’s death – Maud reads from Davison’s copy of Olive Schreiner’s Dreams, poems which the suffragette Constance Lytton remembered being recited in prisons. 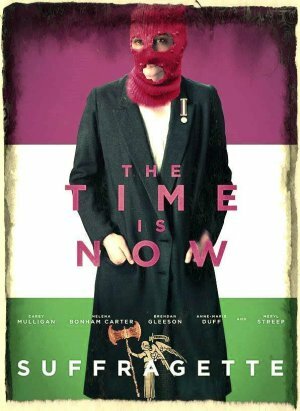 Such a film might also cast some light on the range of ways in which the suffragette movement did reach out to women who had not previously considered themselves political, and would draw on how they articulated their experiences as a route into collective action. The motivation that the film gives for Davison’s courageous protest is a very modern one: to capture the gaze of the world’s media and, through representation, to create change. This is asserted as the final triumph in the film: making the headlines as a martyr changed the narrative that led to suffrage for some women over 30 in the UK. Skipping lightly over WWI and the suffragettes’ investment in the war effort (including suffragettes shaming conscientious objectors), the film draws a direct connection between the Pathé cameras at the racetrack and the extension of the vote to women globally, implying that the film itself is a similar intervention into global media. As widespread coverage of Suffragette has shown, the film is an important intervention, one that matters deeply. Everyone should see it as it’s the starting gun, not the finish line, in the race to an inclusive, equal cinema. There’s lots to learn from and lots to debate – as the Sisters Uncut protest on the red carpet at the UK premiere. Precisely because the film rightly demands, and has received, massive media attention, it matters that it has chosen a conventional, “accessible” narrative focused on an “everywoman” (who just happens to be everywhere) and that there’s a concomitant erasure of suffragettes of colour, lesbian and bisexual suffragettes, working-class grassroots organising, anarchist women and the real work of social change. And the film’s fade-to-white conclusion suggests that it thinks its work is done: and not through militancy but through respectability. There is Maud, still at the centre of the drama, organising the porcelain cups for the post-funeral tea, finally wearing the neat straw hat, linen coat and clean white gloves that she so admired in the shop window at the beginning of the film. Suffragette is on general release now. First picture is a modified UK poster of Suffragette, digitally altered by Eley Williams. It shows a person wearing a long black coat, with a Suffragette gallantry medal in the lapel, with their hands in their pockets and with a purple balaclava covering their face. In the background there are Suffragettes’ colours: purple, white and green. 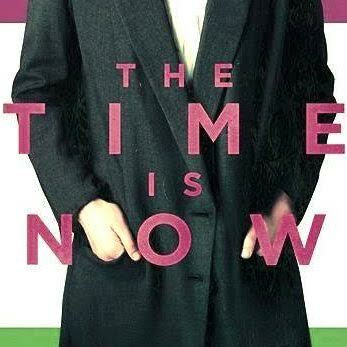 There is lettering “THE TIME IS NOW” across the person’s body and “SUFFRAGETTE” at the bottom of the poster. Second picture is courtesy of Feref Limited. 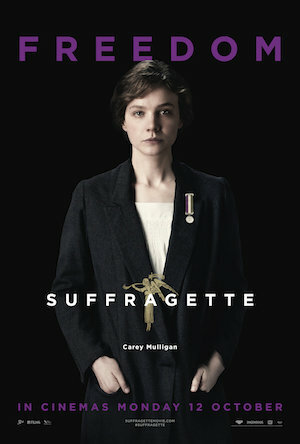 It shows a woman (it’s actress Carey Mulligan) wearing a black coat, with a Suffragette gallantry medal in the lapel, holding her hands in her pockets. She’s looking into the camera with a serious expression. There is a purple lettering “FREEDOM” at the top, white lettering “SUFFRAGETTE” and “CAREY MULLIGAN” in the lower half and purple “IN CINEMAS MONDAY 12 OCTOBER” at the bottom of the image. Third picture is a still from the film, taken from the film’s official Facebook page. 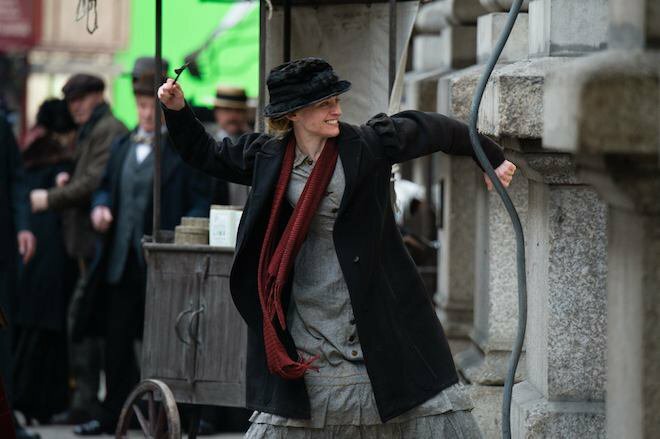 It shows a woman (it’s Anne-Marie Duff as Violet) on a busy street, wearing a long coat and a burgundy scarf, in the middle of throwing something towards the wall to her right. Sophie Mayer is the proud author of POLITICAL ANIMALS: THE NEW FEMINIST CINEMA (I.B. Tauris), a brand new study of the huge wealth of independent international feminist cinema (including alt.costume drama) that's unafraid to be intersectional, diverse, queer, punk, outrageous and generally in no way a conventional British heritage drama.